Adopting an integrated approach to city-region resilience, built upon TEST’s tools and approach, has the following benefits. 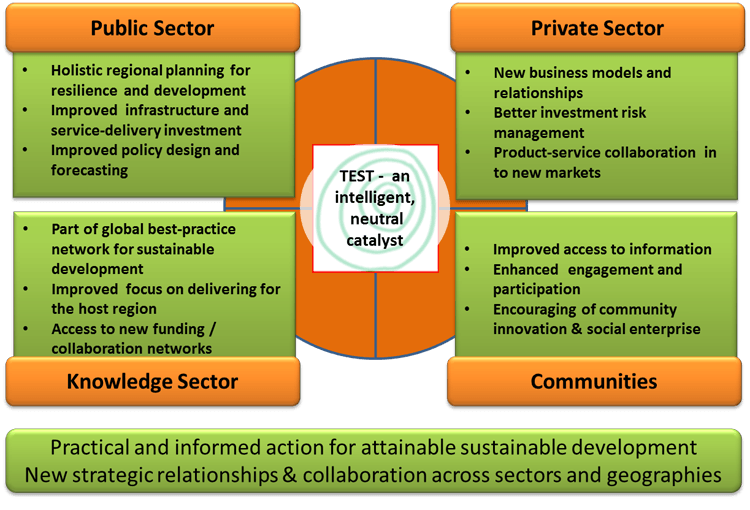 TEST aims to be a neutral catalyst and facilitator of cross-sector collaboration and innovation. We are developing a network of international collaboration partners and already have strong links with the following organisations. Chongqing University’s International Centre for low-carbon Green Buildings and Eco-cities. Lund University (soil systems and resource flows). University of Iceland (health and climate). Leeds University (global-regional-national trade flows and modelling).